Clutch Couriers, a local bike courier service, hopes to pick up some of the slack if USPS stops delivering on Saturdays. Photo by Isaac Miller. 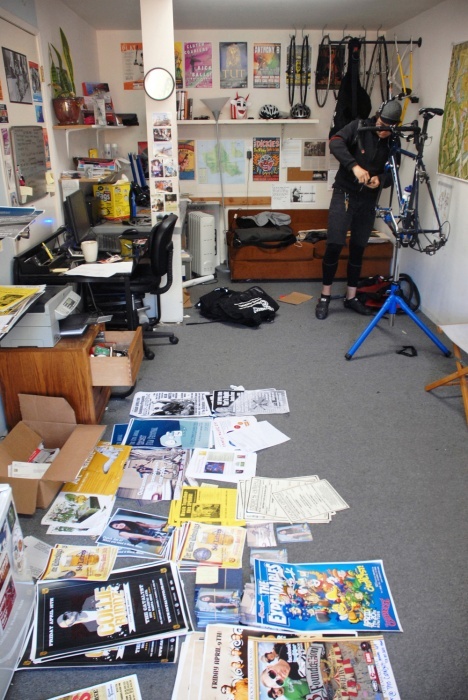 Matt Mispagel tunes up his bike in the Clutch Couriers office on River Street. Photo by Isaac Miller. This oft-quoted and relatively well-known saying has come to be emblematic of the United States Postal Service (USPS), yet even they can be slowed by the economic recession. With economic hardships forcing everyone to tighten their belts, Santa Cruz citizens have turned to more cost-efficient means of delivering their mail. One such method is the employment of the bicycle courier. Since the the turn of the 20th century, bicycle couriers have earned their reputation as being fast and reliable in larger cities such as San Francisco — able to beat lights and fly past traffic, the bicycle courier is considered by some to be the perfect solution for local rush deliveries. Courier companies also possess a local charm, with their staff often being composed of people with intimate knowledge of the areas in which they work. And by riding their bikes, courier companies lack the harmful greenhouse gas emissions that are inherent with any other motorized business. Local bicycle courier companies, such as Clutch Couriers and Pedalers Express, recognize the strengths of operating in Santa Cruz. While the demand may perhaps be higher in larger cities, Santa Cruz’s couriers still have an important niche in the community. Local courier companies will typically bike several hundred miles a week. Able to deliver virtually anywhere across the county — from San Lorenzo Valley to Watsonville — in a matter of hours bicycle couriers are able to get what you need, where you need it fast. Many local businesses, law offices, and other groups are already making use of these bike messengers. Clutch Couriers, boasting an impressive and diverse clientele list, is well-received by those who call upon it. “They always do what they set about to do — you can always count on them,” Bergeron said. However, courier companies are not exempt from the economic recession. Recently, Pedalers Express lost quite a few of their biggest clients. Clutch Couriers also saw a significant drop in its advertising and entertainment sector. With the continual development of technology coupled alongside the economic downturn, Cott finds that the contemporary bicycle courier riding harder and faster may not be enough. However while some old doors may close, courier companies are constantly alert for new business opportunities. During the harder-hitting time in the recession, for example, Clutch Couriers experienced a notable uptick in its handling of legal documents. The U.S. Postal Service’s motion to cancel its Saturday deliveries may serve as another such opportunity. Although the work is hard, Graves and other bicycle couriers would agree it’s worth it.